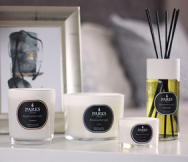 This sensational three-wick candle from our sensuous Black Magic range features luscious bergamot and fragrant rose, supported by passionate patchouli and alluring lavender and rosemary in the purest natural wax candle. Bergamot is a citrus fruit and the essential oil is taken from the rind. It relaxes the nerves and muscles, reducing anxiety and stress to put you in the right frame of mind for an intimate moment. Lavender similarly relaxes and calms, helping to clear the mind of tension and worries so you can focus on your partner. Sweet, floral rose is a natural aphrodisiac, and its hypnotic allure and fragrant scent are legendary. Rose petals have been used through the ages in connection with romance and love, gracing both the wedding aisle and the honeymoon chamber. More than just symbolic, the fragrance of rose has the power to free the emotions while balancing and calming the mind. Its restorative effect can help you to let go of past experiences and open the door to new possibilities. Healing, comforting and reassuring, rose can help to alleviate tense feelings, calm mood swings and allow the happiness to flow. Patchouli has a sweet earthy fragrance that is warm and exotic. As a natural aphrodisiac, it is thought to be a powerful attraction oil. Used historically for increasing the libido and promoting sexual response, patchouli essential oil is the perfect way to set the mood. Patchouli helps to relax and slow breathing, stimulating the senses and heightening every sensation. Rosemary is a much-loved herb in the kitchen but has more to offer in the bedroom. It increases alertness and, combined with lavender, it has been shown to produce a feeling of contentment. These exquisite essential oils are expertly combined in the purest natural wax and presented in our iconic Black Magic luxury packaging – a perfect gift for a busy couple or a fabulous treat for you and your partner to enjoy.